Book Blurb: Marilee Harper is desperate to find another job after she accidentally set fire to the home of the richest woman in town. Converting an old hospital into a bed and breakfast seems like a golden opportunity. But faucets and lights turn themselves off and on, and old baseballs fly without help. Stressed and aggravated, Marilee wants nothing more than to redeem herself, even if it means hands off her sympathetic boss! Here’s what I thought: The concept for this story hooked me from the blurb. Who could resist ghosts and fairies, and a hero and heroine destined to fall in love? The actual plot, however, didn’t quite meet my expectations. Marilee and John’s romance was skittish and lacked the emotional depth for a true romance. And the real paranormal element didn’t really come into the story until about the last quarter of the book. There were miniscule hints, but there wasn’t enough build-up to the reveal so the climax seemed like a huge paranormal information dump. As a result, the battle of wits between Marilee and the King of Fairies was anti-climactic. Throughout the story, there are references to Shakespeare’s The Tempest. Perhaps if Marilee would’ve taken the advice of her friends and read the play earlier there might’ve been more opportunity to explore the paranormal element, rather than rushing it in the end. Having said that…I commend the author on creating a non-traditional hero and heroine. John Smith is a beta male, not an alpha, but he is endearing and quirky in his own right. Marilee isn’t the standard Barbie-version heroine, either. She’s a rough-talking, cigarette-smoking gal dealing with family and financial issues that most of us can more than identify with. 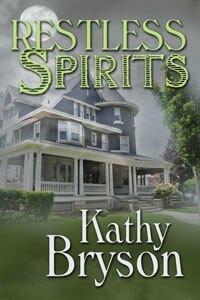 Overall, I did enjoy reading RESTLESS SPIRITS and it piqued my interest for the first book in the series, FEELING LUCKY, which was reviewed last year by Smart Girl Trina. (Click here to read that review.) FEELING LUCKY went on to win the 2014 National Excellence in Romance Fiction Award for Best First Book. This book was provided by the author for an honest review. No other compensation was offered or received.